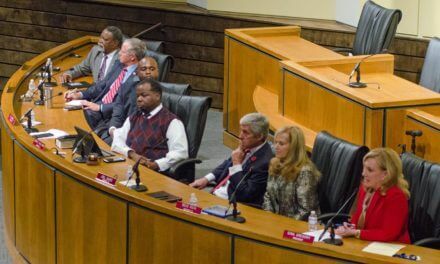 The Fairhope City Council Monday evening approved a $344,852 donation to the Baldwin County Board of Education for use in the city’s five public schools. This year marks the third year the city has donated to the schools, giving a total of more than $1 million to Fairhope students, BOE member Cecil Christenberry, who represents the Fairhope area, told the councilors. The council also extended the time for which the schools could use the money, from the end of the fiscal year to Dec. 31, 2015. The council also extended the deadline schools had to spend funds left over from last year, from the end of the last fiscal year in September to May 31 of this year. The move that was discussed during a council work session. Councilwoman Diana Brewer, a member of the city’s Education Advisory Committee, told fellow councilors four of five schools still had between $5,000 and as much as $32,000 left over from last year’s allocation. She said there are stipulations put on the donated money and all funds must go to meet certain pre-approved metrics. The committee voted to extend the deadline to allow the schools to spend the money on the pre-approved metrics. Some of last year’s money will go to pay for professional development for teachers at Fairhope High School in October, Brewer said. Fairhope schools already have plans for the 2015 allotment, which have all been approved by the Education Advisory Committee. For instance, J. Larry Newton School asked the city for $83,475 for a reading workshop. FHS wants $148,942 for an advanced placement and international baccalaureate program. Fairhope Middle School is asking for $18,935 to help improve language arts and standardized test scores. Fairhope Intermediate School wants $57,735 to help improve reading scores by 2 percent in the ACT aspire test and Fairhope Elementary School wants $35,765 to improve reading and math proficiency. The council also voted to reappoint Julia Summerlin, Bob Riggs and Jim Kellen to new three-year terms on the Education Advisory Committee. The council discussed a beach maintenance plan at its work session Monday for its bay beach parks at Magnolia Beach and Bluff Park and North Beach Park at the municipal pier. Scott Douglas, with South Coast Engineers, suggested the council look into adopting a beach maintenance plan to help combat erosion issues at both spots. One of the advantages to having a beach maintenance program, Douglas said, is that the Federal Emergency Management Agency will help rebuild damaged public facilities that are part of a program. The council discussed a 2014 emergency repair project for Magnolia Beach, which placed 3,300 cubic yards of sand at the north end of the beach. An organized plan would help mitigate some of that work, Douglas said. Council President Jack Burrell said the council would have to consider how much a plan like that would cost, which is unknown at this time. Burrell then considered the possibility of partnering with Daphne or the county for similar work and sharing the cost. The council was split on the issue of whether to subject Knoll Park to a prescribed burn. The issue wasn’t up for a vote Monday, but it was discussed, during the work session. Burrell and Brewer favored the move to burn some of the pine trees at the city park, while councilmen Rich Mueller and Kevin Boone disagreed. Burrell also hinted that Mayor Tim Kant was also against the idea. Kant wasn’t present at the meeting. Burrell said a maintenance plan for the park calls for a burning and it needs to be done soon. “Every longleaf expert in this country says you should burn,” Burrell said. “Burning a park downtown is not a good idea,” he said. Mueller said the burning is designed not to help the trees, but the understory in a forest. Councilman Michael Ford appears to be the swing vote on the issue, which Burrell said he’d like to bring up for a vote in the future. The council also discussed the addition of six city tennis courts, during Monday’s work session. No vote was taken, but councilors debated the merits and cost effectiveness of hard courts and soft courts. Burrell said members of the Fairhope Tennis Association had requested a green clay or rubico surface be installed on at least two of the six new courts because they are easier on the body. The money for the new courts was budgeted in fiscal year 2015, Burrell said, and putting the project out for bid would solve the price issue. He said if the bids came back too high on the clay courts the city wouldn’t move forward with them. Another issue with clay courts is maintenance. Ford argued clay courts would be harder to maintain than asphalt. During the meeting, the council approved new rules for the municipal tennis courts. The new rules are as follows: Please limit your time to one hour if others are waiting; no skates, skateboards, or bicycles allowed on courts; turn lights off when finished; private lessons, or clinics allowed with permission of city; proper shoes and attire required at all times and pets must be leashed and picked up after.